Honda Accord Price Or Payments Pros and Cons | Page 1 of 2 | Why Not This Car? In my area used Accords cost more year by year than Camrys do. Year for year used Accord prices in my area are higher than Camry prices. It was simply too expensive. The dealer was terrible. No price break offered or given upon my request. I walked. 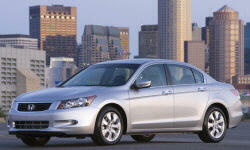 The Accord is priced at a very reasonable price point for the different models. The new car prices are over rated for what you get because the value loss in the first 3 years. The car had 5K miles on it; the price for a loaded EX-L (no navi) was $19,400. It now has 12K & is very nice especially for the price. The low deprciation is a double edged sword and V6 Accords were about $3000-4000 more than any of the Maximas I was looking at. Pricey to buy both new and used, but worth it for the reliability and resale. Best car for the price. Unable to obtain any like american car for the same monthly payments and we have leased for 12 years. I bought in December 2007 in Woodbridge, VA. I got a great deal. All said and done after all taxes and fees: Less than $21,500.